Remember the famous puzzle, Sokoban? What would it be like if we added a gun, tons of enemies and a timer? Behold our new game, Zocobana! The task as always is simple: move the boxes into place with more complicated puzzles. However, now you have to fend off enemies crawling and shooting at us while dodging lightning. And this should be done quickly, as a timer is ticking. 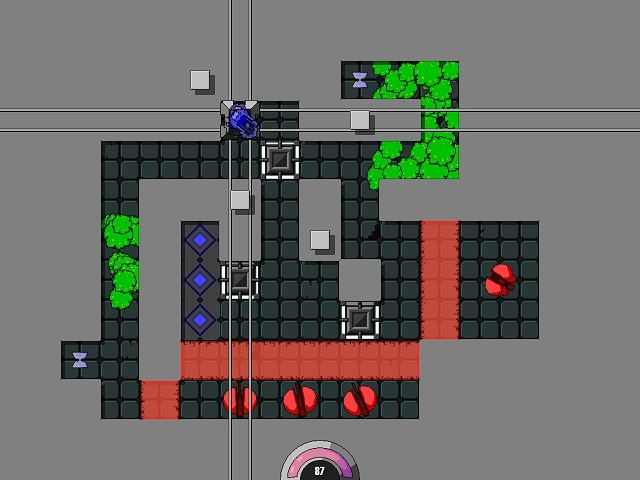 Direct using the arrows, shoot with the left mouse button, and press the Space for early completion of the level. Good luck! Remember the famous puzzle, Sokoban? What would it be like if we added a gun, tons of enemies and a timer? Behold our new game, Zocobana! The task as always is simple: move the boxes into place with more complicated puzzles. However, now you have to fend off enemies crawling and shooting at us while dodging lightning. And this should be done quickly, as a timer is ticking. Direct using the arrows, shoot with the left mouse button, and press the Space for early completion of the level. Good luck! Remember the famous puzzle, Sokoban? What would it be like if we added a gun, tons of enemies and a timer? Behold our new game, Zocobana! The task as always is simple: move the boxes into place with more complicated puzzles. However, now you have to fend off enemies crawling and shooting at us while dodging lightning. And this should be done quickly, as a timer is ticking. Direct using the arrows, shoot with the left mouse button, and press the Space for early completion of the level. Good luck!